I finished this début novel today and moved on to another first book, “Lost Girls” by Andrew Pyper. Fleming has a huge talent, an incredible gift for narrative and dialogue and establishes place so convincingly that you can smell, see, hear, taste and feel it. Yet, I had to push hard through the last 40 pages. The book felt like it ended earlier at page 418 with this powerful paragraph … Ever since she’d first glimpsed her mother crying at the hospital, afraid the accident had been her fault, Glynnis was attuned to vulnerability in her mother. Sometimes she turned a blind eye toward it, saw it and then pretended she hadn’t. Today her heart broke for the woman. Minutes earlier Glynnis had never felt closer to Carol. But Carol. By walking away, Carol had broken a contract she and Glynnis had signed by being born a year and a half apart. I wanted to be dropped right there, left by the author to brood over what the future might hold for these anomalous sisters. If Andrew Pyper writes as he speaks, with caustic wit and insight, if his voice is true and genuine, then I can’t wait to get into “Lost Girls“. I heard him speak recently at the Ontario Writers Conference and was first to the bookseller’s table to buy his début book rather than one of his subsequent titles. “Terrible experiences pose the riddle whether the person who has them is not terrible.” (Nietzsche, Beyond Good and Evil). Points to Ponder: Terrible girls? 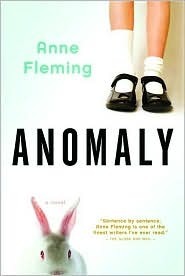 The two sisters in “Anomaly” have terrible experiences growing up in the bewildering 1970’s and 80’s. Carol is a genetic anomaly, an albino. A horrible childhood accident leaves Glynnis anomalous in an entirely different way. Are the sisters, therefore, in terms of Nietzsche’s riddle, terrible? The jacket of “Lost Girls“, describes a terrible experience. Two adolescent girls go missing, presumed to lie on the bottom of a lake just outside the local town. Are the two fourteen-year-old girls also terrible? The book is your’s when I’m done with it. I’ll have to post a follow-up to this with a mini-book review. It all sounds, well … terrible. Pypher was light-hearted and full of humour at the ORC – quite a contrast to the topics in his books. Dibs and Loansies. « McClelland & Stewart Launches Signal Books!